Once upon a time there was a desolate sword in a stone. Not even the strongest man could make it budge. All the men throughout the land tried to no avail. Then when no one was watching a young boy appeared. Without any effort he pulled the sword from the stone. He was the chosen one! That boy is King Arthur! He is a brave knight who fought off evil during medieval times. Known to be one of the fairest kings who ever lived. His sword play, and fighting skills were known through out the land. He was calm, crafty, and pretty darn handsome. All the best traits of a hero! Your child can be just like him in the Child Medieval King Arthur Tunic. The 100 percent polyester fabric has Velcro at the back of the neck, and the cape fastens to the tunic. Faux fur trims the collar, shoulders, sleeve cuffs, and hem lines for an added royal look. The vinyl gold crown has a red faux gem on the front and fastens with Velcro at the back. 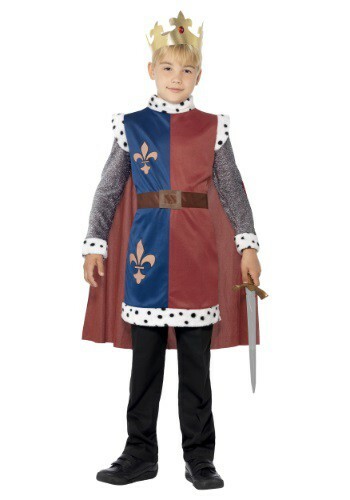 Just add a toy sword and you will have your very own King Arthur! Team up with Robin Hood and some other heroes for a fantastic group costume. Add in some cool sword fighting moves and your King Arthur will be ready to take the lead into a new action packed adventure.